Jan. 3, 2012: The Highland Park School District Financial Review Team issues its report to Gov. Rick Snyder, confirms that a financial emergency exists, and recommends the governor appoint an emergency manger. Jan. 12, 2012: Snyder agrees with the review team’s assessment, and determines that a financial emergency exists in the district. Jan. 12, 2012: Michigan Department of Education announces it will advance $188,000 in state aid so the district could make payroll. Jan. 27, 2012: Gov. Snyder appoints Highland Park’s first emergency manager, Jack Martin. Feb. 8, 2012: Michigan Department of Education advances $261,000 in state aid so the district could make payroll. Feb. 15, 2012: An Ingham County judge rules that the review team violated open meetings law by not meeting in public. Feb. 22, 2012: Financial review team reconvenes, and allows public comment. Feb. 23, 2012: Financial review team resubmits its report to Gov. Rick Snyder. 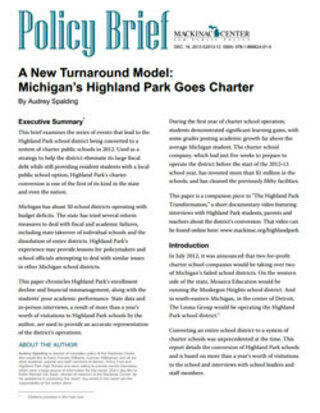 Snyder re-determines that a financial emergency exists in the Highland Park school district. March 2, 2012: Gov. Snyder reappoints Jack Martin as emergency manager. May 10, 2012: Joyce Parker appointed as emergency manager, succeeding Jack Martin. June 8, 2012: Parker issues her first order as emergency manager, laying off most of the employees of the school district. June 18, 2012: Parker announces a plan to convert the district to a system of public charter schools and create the Highland Park Public School Academy System. June 18, 2012: Parker issues order to request applications from charter school operators to run the district’s schools. July 27, 2012: Parker announces that the district will contract with The Leona Group to run Highland Park schools. Sept. 4, 2012: First day of school for the new Highland Park Renaissance Academy schools.